This is a magical, reassuring story of one adoptive family”s beginnings, told in words and pictures that are just right for the youngest child–an ideal story to share with families everywhere. Mary’s Review: This little book is absolutely beautiful. The story is simple enough for a child to understand what adoption is and how special it is to be adopted by a family who really wants you. The illustrations are so colorful and bright. Each new page reminds me the patch work quilts my grandmother used to make. Author Bio: I have always been interested in folk art from around the world, Indian miniatures, Mexican ceramics, fabrics, Chagall, Matisse, children’s art, and primitive painting, and I love to paint and experiment with pattern, texture, collage and color. The careers I’ve had–as a costume designer, a quilt maker, a fabric artist, and a graphic designer–have taken all these interests into account. Looking back, I can see that these passions and career choices have played a large part in influencing me to become a children’s book author and illustrator. But most importantly, it was after my husband and I adopted our daughter from Guatemala that I was inspired to do a children’s book for her. 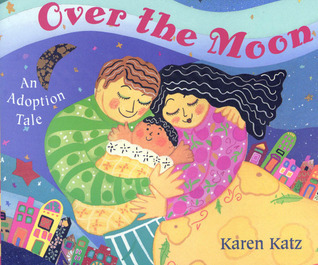 My first book, Over the Moon, was the story of that magical experience of welcoming our daughter Lena into our lives. I painted, I drew, I collaged, and I wrote, and after working very hard… a beautiful book was born! Twenty-two books later, my daughter–now fourteen years old–still is an inspiration for me. I am fascinated by babies and little kids. The simplest words and gestures can make them laugh. Sometimes standing in line at the supermarket and watching kids in grocery carts, my best ideas are born. I am fascinated by people from all over the world and what they look like and how they live and the differences that make us all unique.